S. L. , carrier on route 2 out of Anna, Texas, received the appointment Sept. 1, 1903, and has been continually in the service since that date. Route 2 is 27.62 miles in length, serves about 140 boxes and supplies an intermediate postoffice by lock pouch. Route 2 was 23.50 miles long at the start; later it was extended to 27.13 miles in length, and still later it was again extended to 27.62 miles in length. Mr. Bradshaw has been identified with the county organization from soon after his appointment. 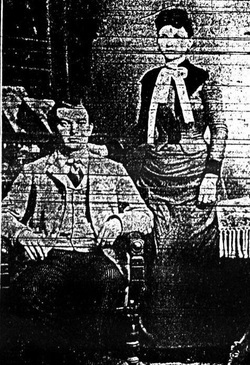 He was in the first annual state R. L. C. association at Dallas, Feb. 22, 1904, at which time the Farm and Ranch and the Dallas News made the carriers feel like they were somebody, and, at least some of us had our first experience of "Dining in marble halls." He represented the Collin county R. L. C. association at the last annual State R. L. C. association at College Station, July 4th, 1911. He attributes whatever of success he has attained in the service to a conscientious performance of duty, and where in doubt, advising with the postmaster, reporting every irregularity, and has never received an adverse ruling from the postoffice department during his nine years of service. S. L. Bradshaw holds the position of editor of the Rural Route Carriers’ column in this paper. He is a writer of distinct ability and wide range of thought. His column in these papers is proving to be not only entertaining to his brother carriers and public in general, but his matter published is also helpful and instructive to all parties concerned and cannot fail to result in an improvement of the rural free mail delivery service of Collin county. The writer has enjoyed the acquaintanceship of S. L. Bradshaw for many years. We have ever found him to e a well informed, public-spirited citizen and always pulling for advancement along all lines for his fellow man. Uncle Sam made no mistake when he conferred an important responsibility upon him. S. L. Bradshaw has the solid backing of brains, courage, integrity, grit industry and perseverance. He is bound to acquit himself with credit and as it necessarily follows thereby also reflecting credit upon the postal arm of our federal government which he is so efficiently serving.